“Days of Future Past” presents a unique and enjoyable tale that takes readers back in time to discover a fascinating story that spans decades. In this fascinating tale, the author effectively weaves together different characters from different times and places in history while telling a tale that will remain in the hearts of every reader who gets to discover it. Things are not always what they seem. 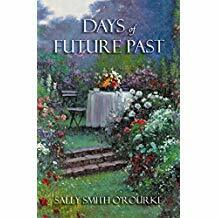 As a master of writing unique and interesting fiction novels, Sally Smith O’Rourke brings an enthralling and page-turning plot. She narrates a heartwarming story of a connection that was once lost but found its way back again. She effectively weaves together different characters from different times and places in history while telling a tale that will remain in the hearts of every reader who gets to discover it. In Days of Future Past, readers will discover how fate intervenes with people’s lives. After an earthquake struck the region of Southern California, the fateful event reconnects old lovers, Ann Hart, and Ted McConaughy, twenty years after they canceled their wedding and parted ways. Haunted by the nightmares that keep Ted awake for many nights, he seeks the help of Ann’s expertise in order for him to find the clarity and peace that he needs. Through this fateful reunion, they both go on a journey that gives them a chance to rekindle the flame in their hearts and teach each other how to forgive. Will Ann ever forgive Ted for the pain that their past has caused her? Will Ted finally be free from the nightmares that had been haunting him for a long time? Will they ever give each other a chance to love again? Readers will discover the answer to these burning questions through the pages of this wonderful book. Hoping to share this fascinating story through Ted and Ann’s perspective, Days of Future Past joins the upcoming 2018 Miami Book Fair International. This book, along with many other titles from different genre types, will be on display during this highly-anticipated affair runs from November 11, 2018, through November 18, 2018. So, be sure to save the date!